In 1942, four soldiers vanished from the training program of the newly formed First Ranger Battalion, their names stricken from the roster. Chosen for their unique skills, they would fight in secret against terrifying supernatural enemies and overwhelming odds. 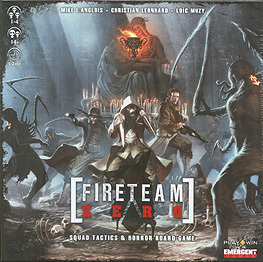 Fireteam Zero is a cooperative game for up to four players who must cut a path through an endless swarm of deadly monsters to defeat the ultimate evil behind them. Each player possesses a set of brutal combat skills that are represented by a deck of cards unique to that character. Play cards to devastate the creatures in your way, help your teammates survive the onslaught, or even reshape the tactical landscape with the proper application of explosive ordinance. Face off against the Children of Typhon, the Infested, and the Fetch, each in their own Operation consisting of three Acts. Your heroes will increase in power as you progress through each Operation, but only skill will bring victory in the final confrontation. EACH PLAYER WILL BECOME A MEMBER OF FIRETEAM ZERO AND COMMIT ACTS OF BADASSERY IN THE DEFENSE OF HUMANITY. LEADER: The team supercharger. This role enhances how the team works together and can pinch hit for the other roles if needed, although at a less effective level. CLOSE COMBAT: The brawler. This role deals death up close and personal, has enhanced mobility, and can hold the line when absolutely necessary. MARKSMAN: The Sniper. Monsters can't hurt you if they can't reach you. Kill at range, provide cover fire for the team, and enjoy the percussive sounds of your M7 grenade launcher. DEMOLITIONS/MEDIC: The angel of mercy and death all rolled into one. Toss a Satchel Charge to change a group of monsters into flaming debris, or keep the team fighting when all seems lost.